Safe Ride Home Campaign | Nashville Injury Lawyers The Law Offices of John Day, P.C. We are proud to announce that the Law Offices of John Day, P.C. will be offering safe rides home once again this year in Rutherford County. St. Patrick's Day is the national holiday of Ireland, but has become the 4th most popular drinking holiday in the United States. Although a great tradition, three-quarters of fatal drunk driving accidents on St. Patrick's Day involve a driver who has drank twice the legal limit. We are sponsoring this Murfreesboro safe ride home campaign because helping victims of DUI accidents receive fair compensation is not enough; we want to help prevent DUI accidents from ever happening in the community in which we work and live. 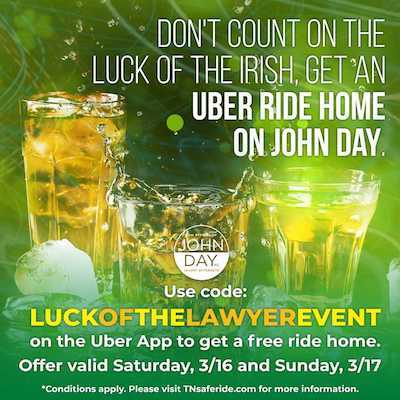 Using code: LUCKOFTHELAWYEREVENT, party-goers will have the opportunity to receive a FREE Uber ride home (up to $25) within a 5-mile radius of Murfreesboro, TN from Saturday, March 16th at midnight - Monday, March 18th until 1 am. If you are going to drink, be smart and plan a safe ride home. Ride codes are on a first-come, first-serve basis, the ride limit is $25 and the total spend will be capped at $6,250. Matter Information: I verify that I am at least 21 years of age and that this offer is good for a one-way ride home, not to another drinking establishment. I understand that rides must be within Rutherford county, I am responsible for any charges in excess of $25, and does not include tip. By agreeing to these terms, I release Law Offices of John Day from any and all claims and / or causes of action, known or unknown, arising from participating in the safe ride home offer.